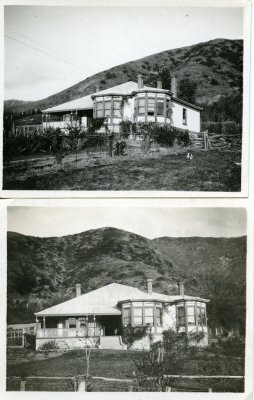 Description Two photographs of Tokomaru homestead at Robin Hood Bay. One photograph is taken from front of house, with greenhouse visible on far left. Second photograph is taken from front of house but slightly further to the right, with wood-pile and garden visible. Covered verandah, with double bay window on one side, on front of house.